Jared started his HX experience as a student in the camp's first year. He enjoyed camp so much that he decided to make it a lifelong investment and from there he went on to be one of the first Student Staffers. As the camp continued to grow over the years so did Jared's responsibilities, and he was "promoted" to Head of Student Staff, and then again to Head of Staff. 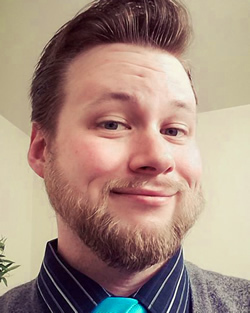 Jared's professional experience lies in personnel and business management ranging from Food Service to Durable Medical Equipment Suppliers, and he currently works in Bellevue at Pacific Medical Systems INC as General Manager and Certified Lactation Educator. He sings with multiple northwest vocal ensembles (both barbershop and otherwise) including Emerald City Voices and Voices Inc. Jared is a proud Baritone, but can and will sing other parts if you ask him nicely  He loves singing tags and can even teach a few! When not working or singing, Jared loves to play D&D and many other tabletop/board games, and is an admitted geek when it comes to anime. Jared can generally be found at camp doing his trademark "Hero Pose" or, as he calls it, "standing". Kat has been with the camp since 2006, and enjoyed 8 years on the risers (7 of which she was over the age limit! They finally convinced her to come off the risers using cookies and responsibility as bait). Her day-job is teaching early childhood education classes to infants and toddlers, as well as teaching Toddler Ballet. She also proudly owns the Cladach School of Irish Dance, in Lynnwood, WA, (established 2004). Kat is also a Sweet Adeline, singing with a cappella Joy (aJoy) in Kirkland, WA, and Lead of Fame & Four-Tune Quartet. 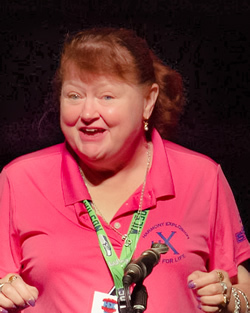 She attributes much of her Sweet Adeline success to the vocal training, and Head Choreographer opportunities provided at camp. Kat, and her husband Evan (not a barbershopper... I know, right?! ), welcomed two littles (featured at camp in 2014 and 2017) and can't wait for them to attend when they are old enough! You'll find Kat anywhere and everywhere at HX camp, but mostly making bad puns, and worse jokes, during announcements and check-ins. You'll never know what hair color she shows up with this year: Attend to find out! Rachel grew up in Auburn, WA in a close-knit family with her mom and nearby grandparents. She knew she wanted to teach music from her first day of 6th grade choir. In high school, Rachel was in the chamber, concert, jazz, and a cappella choirs. Recognizing her love of music, her choir director, Karen (Frerichs) Caldwell, gave her the opportunity to teach the beginning level choir and direct them in concert. She also put Rachel in touch with the principal of the feeder middle school where she established and ran an after school choir club during her junior and senior years of high school. Introduced to barbershop music and HX at 16 by Karen, then an HX staff member, Rachel immediately fell in love with the community the camp provides, and the beautiful PLU campus. She's been to camp every year since. In fact, the camp was instrumental in helping her choose a college program. After graduating from high school and completing her AA from Green River Community College where she sang in the Jazz Choir, she applied to PLU, from which she received her Bachelors degree in Music Education with an emphasis in Choral Music in 2014. Rachel has taught singing to groups and individuals of all skill levels and ages. 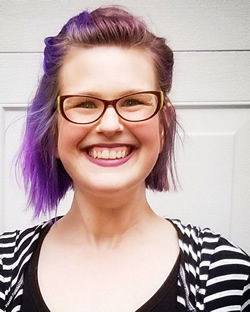 She currently teaches Choir and Music Theory at Tahoma High School in Maple Valley, WA. The choir program has two choir teachers and about 300 students. She LOVES her job and her students! In 2018, Rachel became the director of Jet Cities Chorus, a Sweet Adelines chorus based in Federal Way, WA. She looks forward to working with this incredible group of women every Monday night. In addition to teaching, Rachel has been singing in quartets since 2012 when she was approached by her previous high school choir teacher Karen (Frerichs) Caldwell. She was asked to sing tenor in a brand new quartet. 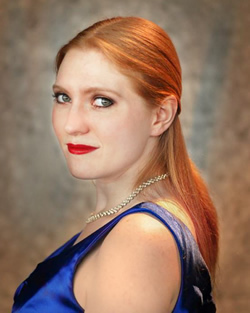 A classically trained soprano, Rachel built on the harmony basics she'd learned at HX. The quartet, The Four Get Me Nots competed regionally, where they placed as high as 3rd, and got the opportunity to compete internationally in Las Vegas in 2015. Rachel currently sings tenor with her quartet, Renegade, placing 2nd in regional competition in 2017 and 11th internationally in Las Vegas the same year, where they had the honor of mic testing for the final top 10 competition. Because of their score in 2017, Renegade secured a spot for themselves at the 2018 international competition in St. Louis where they received 8th place. Rachel currently lives in Covington, WA with her pet betta fish, Tony. When not singing with her quartet or chorus, or practicing music, you might find her identifying spiders, painting, crocheting, playing pool, or watching nerdy SciFi shows. Drew grew up surrounded by music; he sang with the Olympia Youth Chorus and Northwest Honor Choir as a boy soprano, and played trumpet through middle and high school in concert and marching bands. During his sophomore year at Western Washington University in Bellingham he discovered barbershop, and has been singing in choruses and quartets ever since. He holds an international chorus gold medal, an international collegiate quartet bronze, is a three-time district novice quartet champion, and has competed at the district level in quartets on all four parts. Drew's first Harmony Explosion camp was in 2006, and for nearly a decade he would make his way down to Pacific Lutheran University every summer to take part in four joyful days of music and companionship. In the years since he has assisted in several roles: tag teacher, section leader, student staff, and assistant director to name a few. In 2013 he was awarded the Dave Evans Memorial Award for his service to Harmony Explosion. His infectious energy and drive to create extraordinary music has thrown Drew into leadership positions since the beginning. His first experiences in directing came at Harmony Explosion, and since then he's found himself in front of choruses and quartets of all levels. 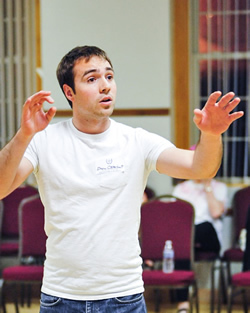 Most notably he founded the WWU Acapella Club at his university, co-directed the Northwest Vocal Project to a 6th place international finish in 2012, and acts as baritone section leader and frequent warm-up director for 4-time International champion chorus, the Ambassadors of Harmony, a 150-voice men's a cappella ensemble under the direction of UMSL Music Department Chair, Dr. Jim Henry. Tags have always held a particular fascination for Drew as a chord enthusiast and multi-part singer. He enjoys collecting and transcribing tags, and dabbles in writing his own. You can often find him in a corner at barbershop events surrounded by a circle of singers putting together some on-the-spot harmony. Tags are one of his favorite tools for coaching vocal craft, being simple enough to learn in a few minutes but acting as great etudes for any number of skills. 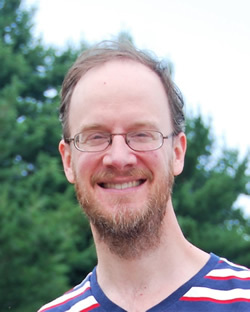 Drew holds a bachelor's degree in physics from Western Washington University and makes his living teaching introductory physics at Washington University in Saint Louis. He is building a career as a vocologist and voice teacher working in research-based pedagogical methods. He will be coming to Harmony Explosion straight from two months of intensive vocology training with the National Center for Voice Science in Salt Lake City. Under The Radar is a mixed a cappella quartet performing in the greater Seattle area for nearly 15 years. In addition to our roles as Harmony Explosion camp staff, which you'll find in our staff bios, we spend the year between camps doing outreach to area high schools and middle schools to raise awareness of a cappella singing and this camp. Our presentation is easily adaptable to any class length and offers students a chance to understand and experience the joys and challenges of a cappella singing. We're delighted to be able to come into classes to educate young people on the benefits of singing and to encourage them to take advantage of the many opportunities they have to continue to sing for life. We also perform throughout the year to raise money for camp scholarships and funding. While we always love bringing the joy of music to private parties and celebrations as well as public venues such as fairs and sporting events, we also consider it part of our mission to bring our music into hospitals, nursing homes, and assisted living facilities for those who have difficulty getting out to concerts. So if you'd like a presentation at your school or you're looking for entertainment for a special event in your life, please contact us either through this website or our quartet website, www.undertheradarquartet.com. Over the years we've had various members, all of whom have served on Harmony Explosion staff. We've decided we must be particularly hard on baritones, though, as we've had to replace our baritone twice now. We were privileged to sing with the late Barry Knott, baritone of Northwest Sound, and more recently, our camp administrator, Del Masson, filled that role until he moved to Blaine. He still fills in for us on baritone or bass as needed. We're proud to be a part of this camp, and proud to serve these young singers year round. A long time musician and quartet guy since his high school days, Adrian is a Singing Judge in BHS, and an active member of the Northwest Sound, the a multi-time Evergreen District champion chorus! He has also won the District first-place medal with two quartets, and has competed at the International Contest with his quartet, Code Blue! 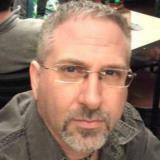 Adrian produces live web streams of Sweet Adeline and Barbershop Harmony Society conventions all over the country! Rob joined the Society when he was 10 years old, singing with his dad in the Lake Washington Skippers. At 15, he began editing the chapter bulletin, placing as high as 4th in the International Bulletin Contest. By 20, he was editing the Evergreen District bulletin, the Timbre. His first quartet was the Rain City Four, with Jamie, Kendall Williams, and Rob's dad, Bob. 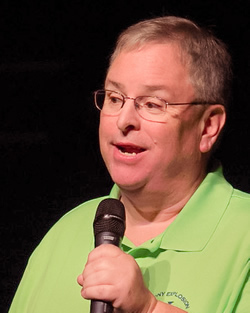 Rob has sung with many other quartets over the years and has sung on the international stage with the Skippers and Northwest Sound 8 times (twice in the top 10). Rob has also worked with both choruses on choreography as a designer and coach, as a section leader (tenor and bari) and Music VP. Rob's sons, Isaac and Brian will both be attending HX camp this summer with two of their cousins (hmm, a quartet?). Rob also has directed his church choir for 10 years. Son of an FAA inspector, Mike grew up all over, from Tucson to Kansas City. As a surgeon, he moved from Kansas City through Ann Arbor, Denver and, finally to Everett where he retired after 30 years as a brain surgeon. While in Denver, he sang with the Sound of the Rockies chorus, and upon moving to Everett in 1993, he joined the Snohomish County Windjammers chorus. Since, he's sung in five quartets, competing as a lead in two and tenor in another. He currently sings baritone with Under The Radar quartet (see below), a new adventure he's happy to enjoy. Since retirement, he's been following his wife's commands, making frames for her paintings and trying to keep their home and boat from descending into ruin. Originally from Calgary, Canada, Jan sang with choruses and ensembles throughout school, and studied piano, guitar, drums and voice. As a Sweet Adeline, she sang with Chinook Winds chorus (Calgary, AB) and a cappella Joy (AJoy - Kirkland) chorus. 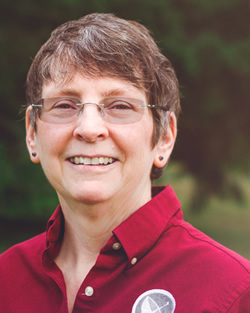 Professionally, Jan's been an accountant, senior systems analyst and database administrator. She currently works with husband Jim in the family sports car business on Whidbey Island, office managing and keeping books. She is also a certified Master Gardener, and loves knitting and crocheting. She currently sings tenor with Under The Radar quartet (see below). Jim and his family live on Whidbey Island where Jim owns two companies, Contemporary Classics International, restoring exotic automobiles, and Simpson Design & Development, designing and building custom sports cars. Jim grew up playing piano, violin, flute, piccolo, and clarinet. He's been active most of his life in theater and musical productions as performer, stage manager, backstage crew, and technician running lights and sound, including building sets and props. 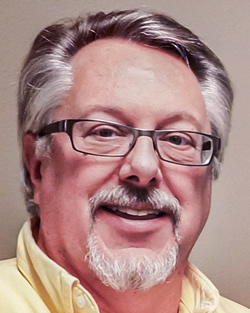 Originally from Houston, Jim had his own company, Stage Production Services, producing and stage managing live theater, concerts and television there. He has also worked extensively with Ward & Ames Special Events, Houston's go-to production house. 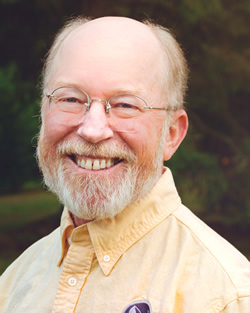 Jim was introduced to barbershop singing by his Sweet Adeline wife Jan in 1984 and since has sung in choruses and quartets in Houston and Seattle. Jim currently sings with the Voices Inc chorus. He and Jan currently sing in the quartet Under The Radar. Chuck grew up on dairy farm in Wisconsin, went to a one room schoolhouse, learned to play the piano accordion and played in an all accordian band for several years. He began singing in high school in mixed chorus and formed a men's a capella quartet that won the all-school talent show. 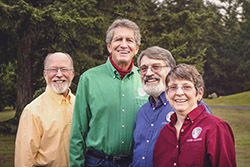 He sang for over thirty years with the Snohomish County Windjammer barbershop chorus, including singing bass and tenor with numerous quartets. 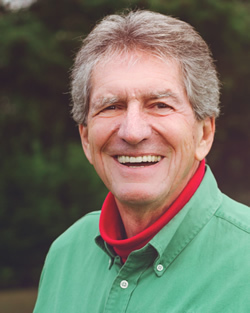 Prior to his recent retirement, Dr. Strub practiced medicine in Monroe, Washington for 40 years treating patients with venous problems of the legs. He currently sings bass with Under The Radar quartet. Mollie Peterson is a 3-time Sweet Adelines International regional quartet champion, and has been a performance coach for some of the top Barbershop Harmony Society quartets and choruses. She first began her barbershop career in high school with her brothers as part of the original "Young Men in Harmony" program. Mollie is the heart of HX, and loves helping kids of all ages keep singing for life. Jamie joined his Dad's chorus when he was 14 years old, and has been a member of the Barbershop Harmony Society for over 40 years. He earned a Bachelor's degree in Music and Education from Western Washington University. 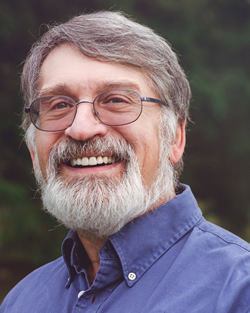 Jamie was the Music Vice President and Baritone Section Leader for the 2-time top ten International competitor, Northwest Sound Barbershop Chorus, and was honored with their Barbershopper of the Year award in 1994. Jamie went on to direct 2 choruses, receiving 3 Most Improved awards in 6 years of competition in Division II of the Evergreen District. In 2004, Jamie received the Evergreen District's Barbershopper of the Year award for outstanding service to the District and the Barbershop Harmony Society.